At Energy Meter Systems we are pleased to offer custom instrumentation buildings, providing the highest measures of protection for onsite instrumentation and control systems. Built to individual customer requirements, our buildings are engineered to comply with local and national codes. 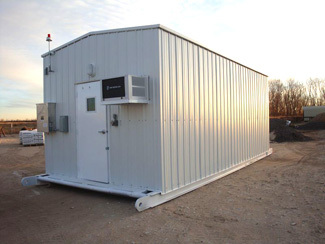 Buildings are field ready, fully assembled and truck transportable, pre-wired with instruments installed for instant field hookup and usage. Drop over or fully floored skids are available, optionally equipped with loading or lifting eyes. Buildings are fabricated with all-welded frames and skids, spray foam insulation, and weather resistant construction. Galvanized ribbed siding is offered in 29, 26, or 24 gauge, with pre-painted baked on enamel in tan, white, blue, or galvanized. Additional features include a 3' wide translucent fiberglass skylight and comprehensive venting systems. Available building styles include shed, lean-to, and gable construction. Various sizes are possible, with widths from 4' to 14'; 6', 8', 10' and 12' heights; and lengths of 4' to 50'. Standard floor plate of 1/8" to 1/4", with floor supports designed according to equipment application. Horizontal sliding windows are available in a number of sizes and configurations. Also included is a three-hinged style door composed of commercial insulated steel with a standard size of 3' 0" x 7' 0" x 1 3/4". All of our instrumentation buildings are quality assured, and fully inspected for integrity.